All the edges in the Cube has same length. We can say, Cube is nothing but 6 equal squares. Surface Area of a Cube = 6l² (Where l is the Length of any side of a Cube). This C program allows user to enter any side of a Cube. 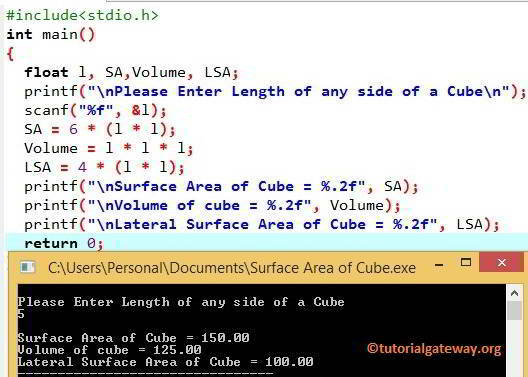 Using this value, this program will calculate the Surface Area of a cube, Volume of a cube and Lateral Surface Area of a Cube as per the formulas.